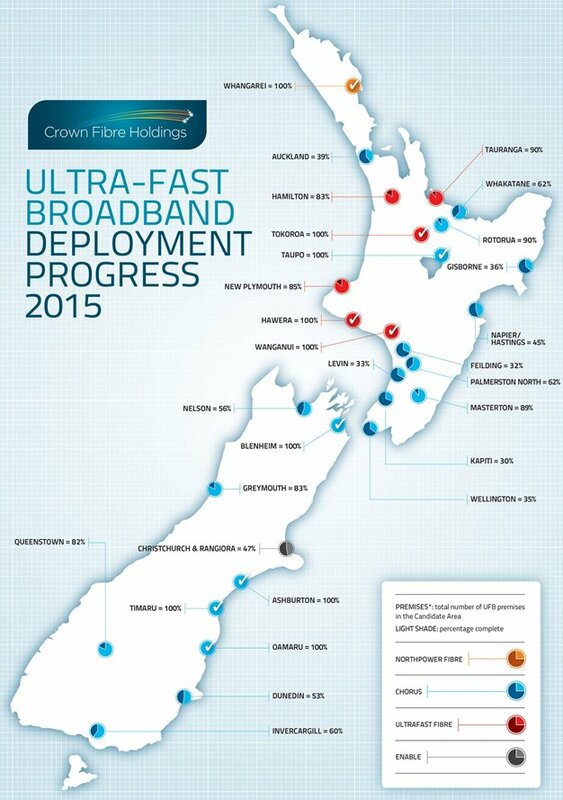 The New Zealand Government?s Ultrafast Broadband (UFB) initiative is now more than halfway completed. Pleasingly, deployment of Fibre to the Premises (FTTP) has tracked ahead of schedule over the last two years. As at September 2015, deployment was 56% complete, with over 800,000 households and businesses able to connect, equating to around 44% of the NZ population able to connect to an optic fibre broadband service. Communal deployment has been completed in 11 of the 35 eligible towns and cities, meaning fibre has been laid on public lands, enabling every household to order a UFB connection. A further eight towns/ cities are expected to be completed by June 2016. Uptake of UFB services is accelerating as Retail Service Providers (RSPs) increasingly see UFB as the right choice for themselves and their customers. Presently around 10,000 households and businesses connect every month. With over 130,000 connections in place as at September 2015, uptake is around one in 6, indicating that there is still a long way to go for New Zealanders to connect to improved broadband. Importantly, deployment to ?priority? premises (businesses, schools and health facilities) is close to completion, and many of these customers report that UFB usage has helped them improve business productivity or service delivery. The goal for the UFB initiative is recognised as being delivered well by the New Zealand Government, to the point that at the 2014 election it committed to provide additional funding to increase the FTTP rollout from 75% population coverage to 80%. A key policy plank of the newly elected New Zealand National Government (Key 2008) back in 2008 was a $1.5 billion fund for the rollout of UFB, aiming to accelerate deployment of FTTP to reach 75 per cent of the population, across 33 towns and cities by the end of 2019. The Government specified that the focus in the period until the end of 2015 should be to provide access to priority broadband ?end users? (being businesses, schools & health services) as well as greenfields developments and certain tranches of residential areas. The Government specified that taxpayers? investment should be made in conjunction with the private sector, and directed so that it should fund wholesale-only, open-access, communal infrastructure (being fibre and ducting on public land rather than customer-specific connections). Companies selling services to end users would be prohibited from owning a majority stake in any UFB infrastructure operator. During 2009 the Government issued a tender document known as the ?Invitation to Participate? (MED 2009), and formed a Crown-owned company, Crown Fibre Holdings (CFH, www.crownfibre.govt.nz) to manage the UFB initiative. CFH is structured on sound commercial principles, to achieve the best possible outcome from the Government?s investment in FTTP, supplemented by private investment through the formation of a number of Public-Private-Partnerships. The Government?s policy defines UFB to mean the availability of broadband services at a minimum speed of 100 Megabits per second (Mbps) downstream and a minimum of 50 Mbps upstream. By comparison, according to Akamai (Akamai 2015) the average Internet speed in New Zealand is currently around 8.4Mbps downstream and less than 1Mbps upstream. Importantly, the Government?s policy is that the UFB network must be capable of being upgraded to offer services at speeds of 1 Gigabit per second (Gbps) on UFB services using Gigabit Passive Optical Networking (GPON) technologies which are being deployed throughout residential areas. The network already offers 10 Gbps on P2P Ethernet technology for enterprises and carriers, with a smaller network footprint largely focused on business areas. All the FTTP services are offered on a wholesale basis under defined Service Level Agreements (SLAs) from any premises within a ?candidate area? (a town or city) through to a point of interconnect at which RSPs offer their broadband services to end users such as households and businesses. In late 2010, CFH signed contracts with two electricity lines companies: Northpower (covering the city of Whangarei), and WEL Networks (covering the cities of Hamilton, Tauranga, New Plymouth and Wanganui). Together these represented about 15% of UFB coverage. In May 2011, CFH signed a third contract with Enable Services Limited, a regional fibre optic network operator owned by the Christchurch City Council, to provide coverage for the city of Christchurch and some surrounding townships, or about 15% of UFB coverage. Each of these three contracts formed a ?Local Fibre Company? (LFC) joint venture between CFH and the respective Partner: these are known as Northpower Fibre, Ultra Fast Fibre (UFF) and Enable Networks Limited. A fourth contract was also signed with Telecom Corporation of New Zealand (Telecom), the country?s incumbent telecommunications company, to deploy UFB across the remaining towns and cities, representing about 70% of UFB coverage. As required by the UFB tender requirements, Telecom took a proposal to its shareholders to ?de-merge? into two entirely separate companies, one called Chorus which owns the local UFB and copper network infrastructure, and another now known as Spark which owns the mobile network and relationships with residential and business customers. The proposal was overwhelmingly agreed, and in November 2011, Telecom?s former network division called Chorus was listed on the New Zealand Exchange and the Australian Securities Exchange. As shown in Figure 1, deployment has progressed strongly since early 2013 when an update was provided in this journal (MacMahon & Milner 2013). By June 2013, just over 300,000 households and businesses were able to connect. As at the end of September 2015, this had more than doubled to over 800,000. Overall deployment is currently 5% ahead of plan, with all of CFH?s four Partners expected to complete their build before 31 December 2019. Deployment to ?priority? premises (businesses, schools and health facilities) is well progressed, with around 93% of businesses within coverage areas able to connect to fibre as at September 2015, ahead of the target of 90% by December 2015. CFH?s partners are on track to offer connections to all schools within coverage areas by December 2015, and all urban public hospitals can already connect. The number of end users able to connect increased sharply in September 2015, due to use of a new geo-spatial view of end users. This more accurately counts end users in Multi Dwelling Units (MDUs) and multiple tenancies in commercial buildings, and also incorporates growth of end users in areas where UFB was deployed in 2011-2015, particularly high growth parts of Auckland. Looking at each of the Partners in turn, Northpower completed UFB deployment in Whangarei in May 2014 and is now focussed on customer connections. UFF, the LFC covering central North Island locations such as Hamilton and Tauranga, is expected to complete deployment in early 2016. Enable, CFH?s Partner for Christchurch and nearby satellite towns, expects to complete deployment in 2018. Finally, CFH?s largest Partner Chorus has already completed six towns and expects to finish deployment including major centres such as Auckland and Wellington in late 2019. The remainder of fiscal 2016 is expected to see UFB deployment completed in a further eight towns and cities, including North Island cities such as Hamilton, Tauranga and Rotorua, smaller centres such as Masterton and Greymouth and the South Island tourist mecca of Queenstown. 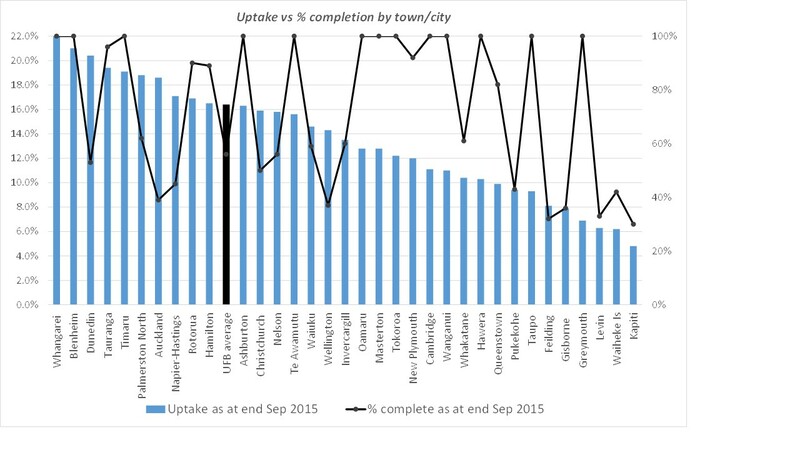 The level of deployment in each eligible town and city as at the end of September 2015 is shown in Figure 2 below. 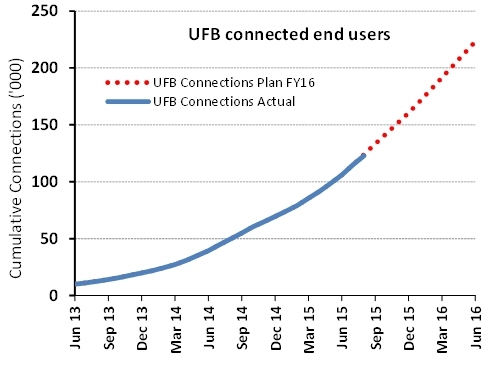 New UFB connections have grown steadily from 2,000 per month in mid-2013 to exceed 10,000 by September 2015. Gross connections per working day have increased month-on-month by over 100% during 2015 as Partners have added installation capacity to meet increasing demand. As at the end of September 2015, more than 133,000 connections were in place, with penetration of 16.4%. (See Figure 3 below.) Demand appears to be following a classic ?S-curve? driven by consumer usage and industry evolution (see Section 4 below ) as well as a level of latent demand as new areas are completed. The rapid increase in uptake across New Zealand has caused some challenges for the LFCs and Chorus, with SLAs for connections being stretched over recent months. All parties are putting considerable effort into providing increased capability into the field to improve connection rates and automating back office processes to satisfy customer demand (see Customer Usage of UFB Services for more detail). Looking at some specific locations, Whangarei, a city of around 53,000 people north of Auckland, continues to have the highest uptake with 22%. CFH?s partner Northpower completed deployment of UFB in Whangarei in May 2014 (the first city in Australasia where every household can connect to FTTP), and since then have had a strong focus on customer connections. As Whangarei has only 60% Internet penetration (that is, six homes in every 10 have a fixed broadband service), more than one in every three broadband services in the city is now on fibre. The city of Dunedin was the winner of a Chorus competition called ?Gigatown? in late 2014. This entitles Dunedin residents and businesses to access UFB at speeds of 1 Gbps Down, 500 Mbps Up at concessional prices. As a result of the competition, uptake in Dunedin has increased rapidly and at 20% is now the third highest of any town or city. Events such as technology expos and promotional campaigns to celebrate the completion of deployment are known to have stimulated demand in some locations. By contrast, locations with lower uptake tend to be characterised by a smaller number of competing RSPs, challenges with backhaul availability, lower percentage built / smaller addressable market, and/ or competition from a Hybrid Fibre Cable (HFC) network. It is interesting to note that whereas Internet penetration in New Zealand tends to be well-correlated with household income, this correlation has not to date extended to UFB. Whangarei and Blenheim have strong UFB uptake but rank 28th and 20th highest in income amongst NZ towns & cities; by contrast, Masterton and Queenstown rank 3rd and 4th respectively on household income, but have below average uptake. In this section we briefly examine some of the factors which are contributing to growing uptake of UFB services which has been seen since 2013. In the last two years New Zealand, like Australia, has seen a proliferation of video streaming services launching. These include global market leader Netflix, Sky-TV?s Neon, Spark?s Lightbox service as well as Quickflix, Video Ezy on Demand and others. Usage of music streaming services such as Spotify and strong interest in video gaming also appear to be driving growth. Increased streaming has helped Chorus UFB connections to increase data usage to 174 GB per month (Chorus 2015), more than double the level of legacy copper connections. According to Statistics NZ 2015, one in three broadband connections now has unlimited usage, compared with just one in twelve a year ago. Major RSPs have been offering product bundles to customers for some time, but in the last two years this has increased. Vodafone was the first RSP to offer pay-TV services delivered via UFB multicast as a ?triple play? offer with broadband and voice. Energy retailer Trustpower offers UFB connectivity and landline services with its electricity and gas services. And New Zealand?s third mobile operator, 2Degrees, has moved into selling fixed broadband (including UFB) in 2015 with the acquisition of Snap, a smaller operator. RSPs are also looking to differentiate with new value-added services. Spark, for example, has launched a home security and automation service called MorePork (named after a species of native owl). For businesses, Vodafone offers Microsoft Office 365, cloud-based back-up and storage as well as web hosting. Others offer packages for specific market segments such as gamers (with traffic prioritisation), shared sites (with managed campus WiFi) and so forth. As the addressable market for UFB services has grown, RSPs have naturally found it more attractive as a broadband access technology. RSPs progressively enabled handovers at UFB Points of Interconnect around the country, with Spark (formerly Telecom Retail) in August 2014 the first RSP to offer UFB services in all locations where FTTP has been deployed. A further milestone was in May 2015 when Spark launched telephony services over fibre. This means Spark, which had previously retained a copper line for telephony when migrating customers? broadband to UFB, can now offer a fibre-only solution. This improves Spark?s economics for migrating customers to UFB, clearly an important point as the firm is New Zealand?s largest RSP. UFB services were initially priced at the higher end of the broadband market. During 2014 CFH?s Partners reduced the price of services at 100 Mbps and introduced new, attractively priced services at higher speeds such as 200 Mbps. As RSPs have taken up these services, retail prices for services at 100 Mbps and above have fallen sharply. In late 2015 entry level UFB services cost much the same as competing copper (ADSL and VDSL) services but for a vastly superior service performance. As described in Section 5 below, demand is now shifting towards higher speed services, which offer both CFH?s Partners and RSPs more attractive Average Revenue per User. Since 2012 there has been a series of mergers amongst major RSPs. Vodafone bought TelstraClear in 2012 and smaller firm WorldXChange in 2015. CallPlus (owner of the Slingshot and Flip brands) bought competitor Orcon in 2014, and FX Networks was purchased by Vocus of Australia also in 2014. Mobile operator 2Degrees bought fixed broadband firm Snap in early 2015. M2 Group of Australia in turn bought the CallPlus Group, and finally Vocus and M2 announced their intention to merge. The effect of this rapid consolidation is yet to be fully seen, but it appears to be allowing RSPs to unlock synergies between disparate businesses. For example Vocus / FX had a strong focus on the enterprise & carrier market, while M2 / CallPlus was stronger in the mass market. SMEs are a customer segment which UFB can substantially benefit. Converged access, multi-site WAN, video-conferencing, remote working/ mobility and cloud-based services are just some of the opportunities for SMEs to use UFB to improve their business operations. However, RSPs have been comparatively slow to target this segment of the market to date, perhaps because of legacy high-margin revenue streams. We anticipate demand will increase of its own accord as customer understanding of fibre service potential develops, but it will also be interesting to see if major RSPs take a more proactive role in targeting the SME segment. It is now apparent that demand for UFB services is moving towards higher speed services. As shown in Figure 5 below, the September quarter saw the proportion of new connections added at 100 Mbps and above almost double. Currently more than two in every five new residential connections take a service at 100 Mbps of above. One in ten takes a service at 200 Mbps or above. It is suggested that this is a function of improved RSP marketing and pricing of higher speed services, as well as increased consumer demand as a result of video streaming and concurrent device usage in the home. It is also interesting that the take-up of 1Gbps services is expanding, although from a small base. It was not expected that this trend would arise so early in the initiative, but driven by the Chorus Gigatown experience early adopters are now demanding these higher rate services. CFH?s four Partners have increased field workforce resources significantly to meet customer demand for UFB installations. However, a sharp increase in UFB orders, which commenced in June 2015 due to additional RSP marketing, has placed pressure on connection leadtimes. Further increases in installation capacity are necessary and are in train. 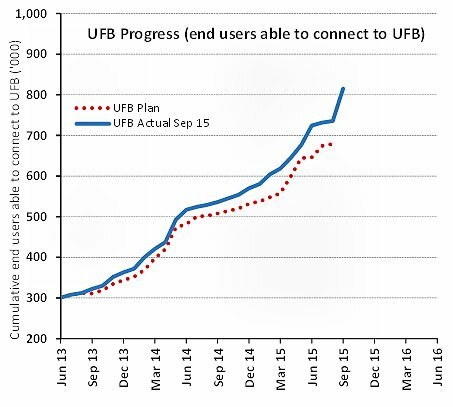 The average period to complete a new UFB connection has increased to around 40 calendar days, and all partners are focussed on reducing this. Meanwhile, both CFH?s Partners and major RSPs are investing in improved business processes and IT systems to deliver an improved end-to-end UFB customer installation experience. This will continue until at least mid-2016. Until automation of appointment scheduling between UFB Partners and RSPs is in place, CFH?s Partners have agreed to manage all post-sale customer interaction until the UFB service is live. Separately, CFH?s Partners are improving UFB installation techniques (with installation using ?ruggedised? cable along a fenceline or in a slot trench notable in the last period of time) and extending subcontractor roles for specialist installation types such as MDUs. All of these initiatives are aimed at improving the customer experience when being connected to a fibre service. At the same time though, many of these initiatives also result in reduced costs for delivering customer connections, which is an added benefit. Finally, the Government has said it is considering changing legislative requirements for consent for UFB installation to be received from landlords, bodies corporate, and (in the case of Rights of Way) neighbours. One option is to emulate the Australian model of designating some forms of UFB installation as ?low impact?, with a statutory right of access applying to such installations. Legislative change may help to shorten installation times, as consents are frequently a cause of delay. In late 2014 the Government proposed that UFB coverage should be expanded from 75% of the population to at least 80%. This was supported with up to $210 million in funding from the Future Investment Fund. CFH has been tasked with forming contracts to achieve this increase, and in September 2015 a Request for Proposals was issued. At the same time the Government said it would extend its Rural Broadband Initiative (RBI), a sister project of the UFB which is managed by the Ministry of Business, Innovation and Employment and aims to improve broadband services in areas not covered by the UFB programme. The Government has also created a Mobile Blackspot Fund to address gaps in wireless coverage along main roads and in tourist areas. These projects are to be funded via a continuation of the industry?s Telecommunications Development Levy to a total of $150 million. In October 2015 CFH was asked by the Government to lead commercial implementation of both projects after policy aspects are confirmed. Customer usage of UFB is wide-ranging and diverse. Below are two examples of the benefits being derived amongst ?priority? customers such as businesses and health facilities. 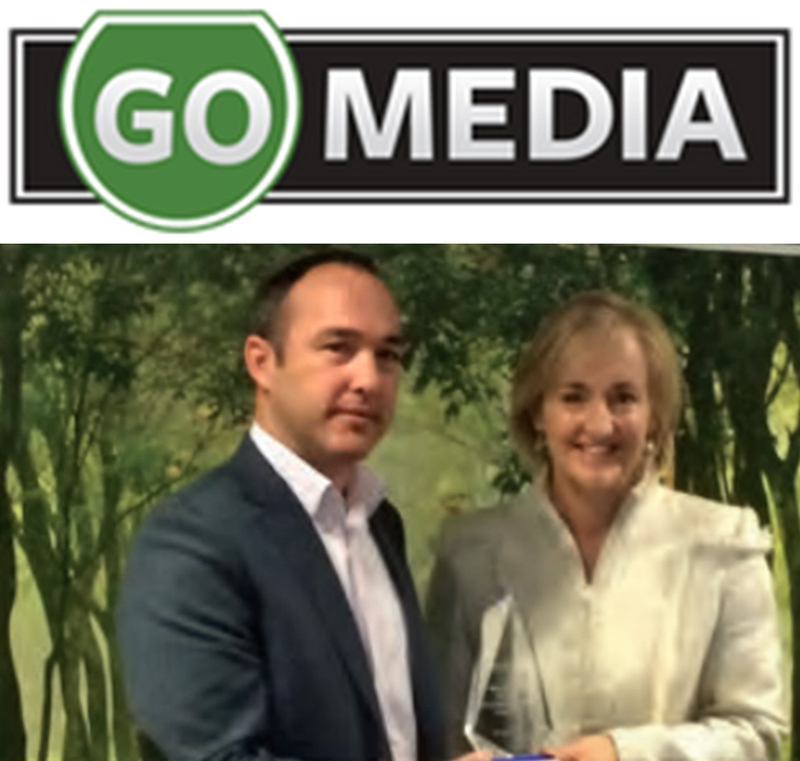 GoMedia is a fast-growing outdoor advertising firm. It was fitting that this business, with its nationwide communication needs, should be the 100,000th customer to take up UFB, in June 2015. The firm needed to bring three separate businesses together, and to share and store large files. It had to be able to upload and download high-resolution images quickly to meet clients? tight deadlines. Director Mike Gray says ?it?s all about speed of delivery. Having UFB will definitely help.? Pricing of the firm?s 100Mbps symmetrical fibre service is similar to its previous copper service. The business also uses cloud-based services including Microsoft Office365, Skype for Business videoconferencing, and file storage service OneDrive. WellSouth is a primary health care network which works with general practices to provide healthcare to 300,000 people in Otago and Southland. CIO Kyle Forde says UFB has also allowed WellSouth to trial video conferencing systems in rural practices and to roll out HealthCloud, a secure health network for its 85 practices. ?That means better outcomes for patients with doctors, clinicians and medical practices easily able to see their history and access information on treatment options.? Forde says clinicians are also logging on for their continued medical education. ?Clinicians would rather spend time with patients than travel to and from training.? In response to the ceaseless growth in the role of digital communications in the lives of New Zealanders, the Government is considering updating the regulatory regime. A review of the Telecommunications Act is underway, and takes specific note of convergence, the growth in ?over the top? services and jurisdictional issues caused by national regulation of services delivered over the Internet. It is possible that the review will lead to revised models for pricing of regulated services, and/ or seek to update New Zealand?s ?Telecommunications Services Obligations? (analogous to the Universal Service Obligation in Australia). The review may also lead to development of a clearer copper-to-UFB migration path. To date, migration to fibre in New Zealand has been entirely led by consumer demand, in contrast to Australia where it has been driven by a Government-supported ?copper switch-off?. The Government has also proposed changes to the National Environmental Standards for Telecommunications Facilities in order to smooth future deployment of UFB and mobile networks. Deployment of UFB in New Zealand is ahead of schedule and the proportion of the population with access to FTTP is now approaching 50%. Demand for improved broadband services is accelerating, driven by changing consumer usage, new applications and services, and an evolving industry. However, uptake still has a long way to go, with only around one in six of addressable households and businesses connected so far. Uptake amongst SMEs has been below expectations and needs to increase if New Zealand businesses are to take full advantage of the opportunities to improve productivity which UFB can support. It is highly encouraging to observe the extent of development within the telecommunications industry over the past two years. Both CFH?s Partners and RSPs have innovated in areas such as UFB products (at both wholesale and retail levels), pricing (offering faster and cheaper UFB services), installation processes (such as fenceline and slot trenching) and IT systems (building improved interfaces between CFH?s Partners and RSPs). While progress of the UFB initiative to date is meeting expectations (Adams 2015), there is clearly some way to go before it could be said that New Zealand had made the most of its capabilities. The roadmap towards completion of UFB deployment by the end of 2019 is fairly clear. The full extent of usage of the network, however, is only just being explored, and offers great promise for the future productivity, innovation and competitiveness of New Zealand. In the meantime, the expansion of FTTP coverage is underway, and new initiatives are being put in place to ensure digital equity in rural parts of New Zealand which are beyond economic FTTP coverage. Adams, A. 2015. "More New Zealanders connecting to Ultra-Fast Broadband network", November 2015 media release. Available at: http://www.beehive.govt.nz/release/more-new-zealanders-connecting-ultra-fast-broadband-network "
Key, John. 2008. "Better Broadband for New Zealand." Speech presented at the Wellington Chamber of Commerce, Wellington, Apr. 22, 2008). MacMahon, R; Milner, M. 2013. "Ultra-fast broadband in New Zealand: Early adoption experience". Telecommunications Journal of Australia, Vol 63, No 1, February 2013.